The Professional Kitchen Herb Pack from Heirloom Organics provides 21 completely new varieties not included in the Family Kitchen Herb Pack! Any home can have the benefit of a professional culinary herb garden with this extensive and well-selected collection of non-hybrid kitchen herb seeds. 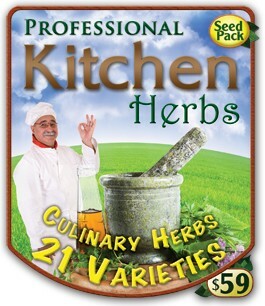 If you are serious about cooking or culinary herbs, you need both the Family and Professional Packs of Kitchen Herbs. Seed Pack ContentsThe Professional Kitchen Herb Pack combines some of the most popular herbs for the kitchen our customers have asked for like mint, black pepper and yellow mustard, as well as some of the harder to find varieties like sesame, lemongrass and anise and even more ethnic and exotic varieties like cardamom, jalapeno chili and epazote. If you are appreciate flavorful food you should have both the Family and Professional Kitchen Herb Packs. Click image above to view list of herbs varieties.